This 15 oz. 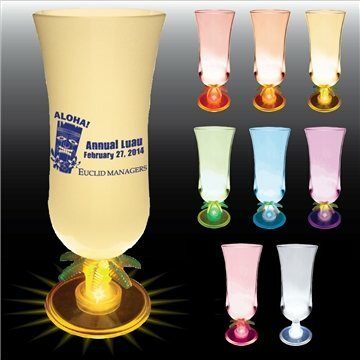 hurricane glass has a palm tree stem that lights up with the push of a button. Personalize this glass with your company name. Replaceable Batteries: Three (3) AG3 batteries. Excellent product, affordable and reasonable price. thank You so very much! I have used this product as a give away to my current clients. So far I have had very positive feedback. This item was great. The imprint of our logo on the product was fantastic.